Nigel Wood, Steve McNamara and Stevo are three of the most talked about – and criticised – figures in Rugby League in this country. This month we’ve spoken to all three, with some fascinating results. Wood has a chance to respond to the very public attacks on several decisions he spearheaded by Super League chairmen earlier this year. Stevo sits down with Jamie Jones-Buchanan to discuss both his remarkable journalism career – rarely aired elsewhere – and the public’s perception of him. And McNamara reveals what it’s like to go from being your country’s head coach in a World Cup on home soil, to becoming an assistant coach in the NRL. 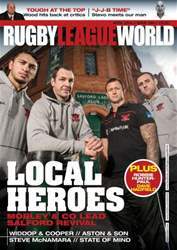 We take a very local look at Salford’s high profile revival, by taking four of their new-look squad down to one of the city’s iconic venues, the Salford Lads Club, for a special photoshoot. Elsewhere, Mark Aston and son Cory talk about life at Sheffield Eagles, we ask Andy Lynch about Castleford’s stunning start to the season and Dave Hadfield queries if Sam Burgess has made the right decision in leaving for rugby union. 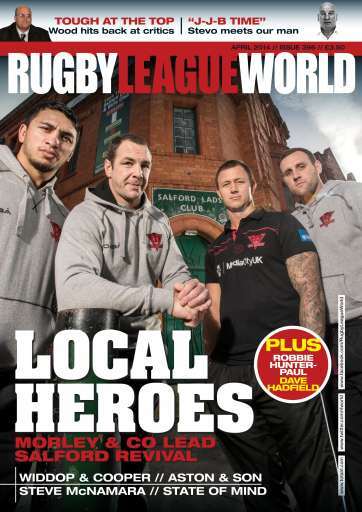 In short, it’s another packed edition of Rugby League World.